Heavy Troopas are giant Sky Troopas that appear in Super Mario RPG: Legend of the Seven Stars. They appear in Nimbus Castle. Their only attack is where they launch themselves towards the character they are attacking, which takes two turns to prepare. They are similar to Tub-O-Troopas, to which the game also refers to as Heavy Troopas when it states "Heavy Troopa's ready to launch." Himan Pata Obese Para; possibly in reference to Sledge Bro. 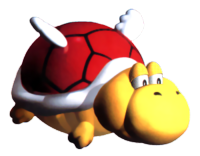 Heavy Troopas appear to be based on Colossal Koopa Paratroopas from Super Mario Bros. 3. They look similar also to Heavy Para-Beetles from New Super Mario Bros. Wii. This page was last edited on April 28, 2018, at 07:12.